As we prepare to flip our mental calendars to April, thoughts turn to the outdoors. Green grass, sprawling acres of it to walk, inhale deep into souls, feel under our toes. Pardon me, allergy sufferers or big lawn cutters. I’m talking golf here. Because, I do. And I’m hoping to get out there on a course in the Syracuse, N.Y., area soon. And swing the sticks just like a guy who was, just like me but some 61 years prior, born in Brooklyn. Wiffy Cox sure is a funny name from the world of golf. He was a good one, too. Wilfred Hiram Cox was born on Oct. 27, 1896, and grew up in a tough Irish-Italian neighborhood of Brooklyn. Looking to earn some cash, he set forth north, to Westchester Country Club, where he learned the honorable trade of lugging the club’s of the well-to-do around that plush golf course. Wiffy Cox became a caddie. And then, according to WikiPedia, he learned to play the game, at sunset with clubs borrowed from the pro shop. The diminutive Cox had a hot-temper and a reputation for foul-mouthed, trash talk among his fellow players. Sort of an early 1900s Tiger Woods without his own caddie/bodyguard Stevie Williams to shoo away interlopers, no? In any case, Cox was pretty good, too. No Woods, mind you, but talented enough to not only turn professional but win 12 tournaments, including 12 on the PGA Tour. 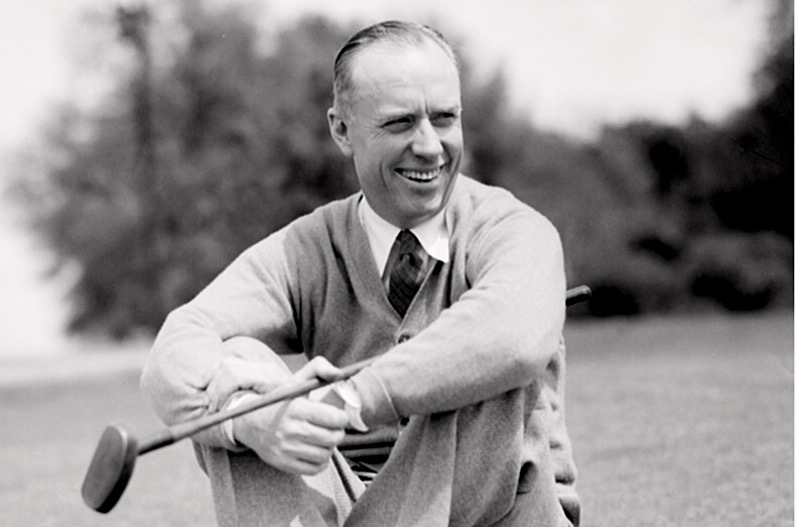 He never won a major, but he did finish tied for third in the 1934 U.S. Open. 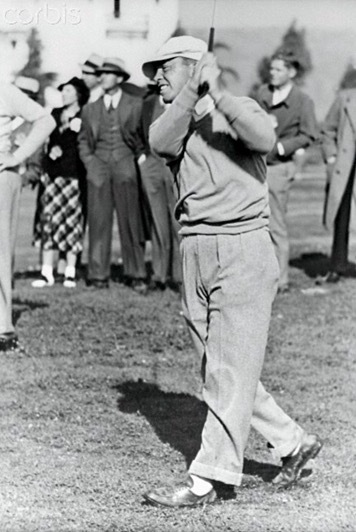 With the Masters kicking off this year’s major rotation next Thursday, you can note as you’re following defending champ Gordon Spieth on your wide-screen that Wiffy battled that famed circuit in Augusta, Ga., to a 12th-place finish in 1937. I wonder if that included any thrown clubs? I’d call 1931 his best year. He won four times on the tour, including an event with the expansive title of The North and South Open, and earned a berth on the U.S. Ryder Cup squad, where he won both his matches against the golfers from the U.K.
After his playing career, Wiffy Cox landed an extremely cool club pro job. He was the top guy at a joint called Congressional. That’s an extremely exclusive course-and-club in Maryland, just outside the nation’s capital. I dare guess that Wiffy Cox rubbed elbows with U.S. Presidents. Here’s the source for the WikiPedia biographical information about Wiffy Cox. This entry was posted in funny names in golf and tagged Brooklyn, Caddies, golf, The Masters, U.S. Open, Wiffy Cox. Bookmark the permalink. Yes, better for baseball, Beth. Wonder if he dabbled in that sport? I dare say that the two of us have the same wonderful, easily pronounced and remembered first name, and last names that would confound most national spelling bee winners. Welcome, Mark! You and Mark B are definitely neck and neck in the discombobulation of last name spell-sense department! Wow, that’s brutal! Not once did I ever consider that c and z sound nearly identical over a patchy phone connection. I must ask – is the “cz” pronounced like a “ch” sound? I’m presuming it’s a Polish surname? Diddy, your blurbery has managed to mention two great movies in one comment section. I bow to you, my friend. Let us not forget that Hiram deserves some respect in its own right, although my mouth debates High-ram vs. Here-um when I see it. Wiffy Cox is a jubilant little name, and he looks happy as a clam (at high tide) in that image there, despite the receding hairline. Evidently when the rest of the country was struggling through The Great Depression, he was out on the links, living high on the hog. Quite an enviable position for any year in the 1930s. And working with Presidents on their golf swing, too, at Congressional. Not bad for a Wiffy to battle Depression, Kerbey. Not bad at all. When you pass your boards and become Doc Dave, you someday will be able to live high on the hog, good sir. Just saying. Thanks for saying “when” and not “if”! I really appreciate that. Sincerely! I have great faith in your intelligence and determination, my friend. I’ve honestly never heard that Willis quote. I’ll have to incorporate that one! I enjoyed reading your article on “The Blog of Funny Names”. Oh, how names change over the years. Keep up the good job of writing. They sure have, freeadress833. Thanks for your kind words. Wiffy, cut lawn and allergy sufferers. Wiffy, sniffy and blow. Ah-choo-choo trained to spot this kind of stuff, aren’t you? More and more, I’m realizing that golf is one of those sports with an extraordinarily rich history – one I’ve never delved into. I’ve appreciated names like Chi Chi Rodriguez and Notah Begay and Retief Goosen and Isao Aoki… wow, the list really goes on… But you’ve definitely piqued my interest here Mark. Well done. Maybe I can hit the links with my brother when he’s in town after I take step 1 of the boards. Haha that’s so awesome. Amazing you got to rub shoulders with so many of the greats, and so many of the funny named greats too!